This impressive four bedroom detached residence is located in the much sought after development of Oranhill, within walking distance of Oranmore village, the lovely Renville Park, and both Galway Bay golf and sailing clubs. Additionally, all services and amenities are to hand, to include national and secondary schools, shopping centres, restaurants, and excellent bus and rail links. It also benefits from nearby access to the M6 and M18 motorways and all major routes and is only 10km from Galway city. This spacious property comes with the benefit of off-street parking to front, a large rear garden, hollowcore flooring, and gas fired central heating. The property extends to approximately 1500sq ft of living space including an entrance hall, living room, lounge/playroom, kitchen/dining room, utility room, and guest wc on the ground floor. Further accommodation to the first floor includes four bedrooms, the master of which is en suite, and the main family bathroom. 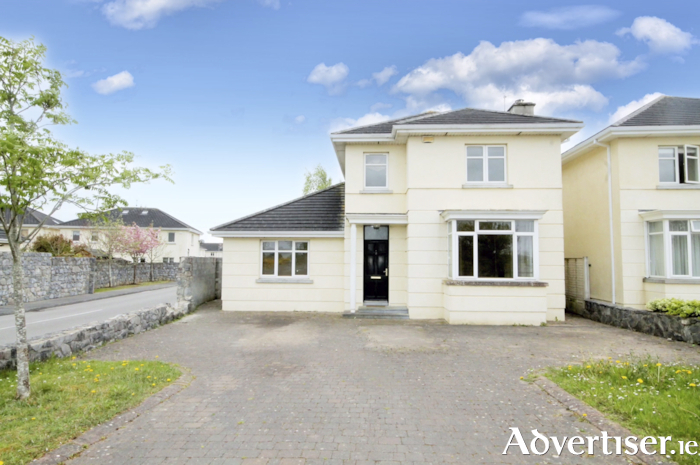 According to selling agent James Heaslip MIPAV, MMCEPI: “This is a great family home in a wonderful location, within walking distance of the lovely Oranmore village, Renville Park, and all amenities. The location is always in strong demand given its excellent range of local amenities, coupled with ease of access to Galway city. While in need of some redecorating, this house offers an ideal opportunity for those in search of a substantial family home in a super community and I would advise arranging a viewing without delay." This property is guiding at €330,000. To arrange a viewing of No 8 Oranhill Road call DNG Maxwell Heaslip & Leonard on 091 565261.